This heroic figure was possessed of a joyful spirit. The Monk of St. Gall recounts that whoever came before Charlemagne sad and disturbed would leave him serene, just by the effect of his presence and some few words. The freshness and honesty of his nature strengthened all those who were associated with him. His majesty did not have a rigid arrogance, nor a suspicious reserve; rather the tranquil grandeur of his personality dominated everything around him, and, notwithstanding, was unpretentious and self-contained. "Then, one could see the Charlemagne of iron, with his head covered by a iron helmet, his arms bearing iron protectors; in his left hand he carried an iron lance, and in the right his always victorious steel sword. His muscles were covered with iron plates, and his shield made of pure iron. "When he appeared, the inhabitants of Pavia cried out with fear: O, the Iron Man! O, the Iron Man!" This Iron Man had a profoundly sensitive heart. Charlemagne wept like a boy at the death of a friend. The victor of 100 battles showed a paternal care for the poor. The man whose steps caused all of Europe to tremble and by whose grand campaigns a million men were conquered was the most tender of fathers, who never could dine without the presence of one of his children. It was his Religion that gave the noblest impulse to his strong and fecund spirit and that conferred glory to his power. And under its protection he placed the peoples that his sword had conquered (2). This magnificent portrait of Charlemagne motivates two different comments from me. The first regards Charlemagne while he was living; the second, his role after he died. Considering Charlemagne during his life, one realizes that he was a masterpiece of Divine Providence in which God was pleased to manifest His glory by the beauty of harmony. With this, God was pleased to shine co-naturally in him. Often God wants to celebrate the supremacy of great and powerful souls over small bodies by contrast: the soul seems to be almost independent of the body. At other times, it is the opposite. God makes men with colossal bodies and with lesser intelligences who became known for their virtues, proving that the grandeur of the body is nothing without moral grandeur. It is said, for example, that St. Christopher was of enormous stature and very strong, but very simple of mind, very naïve, even a little backward. Notwithstanding, from this man with super-abundant physical strength and under-sufficient intellectual capacity, God made a work of art whose upright spirit and great bodily strength charmingly served the Child Jesus. In Charlemagne God put perfection in everything. In him, we see not the beauty of contrast, but the beauty of harmony, of coherence in all things: a great intelligence animating a great body; a great body that reflected the immense grandeur of a soul that would carry out a colossal work, achieve a high virtue and leave a great memory. 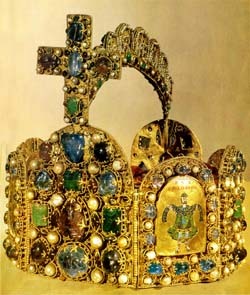 Grandeur in everything was the characteristic of Charlemagne. 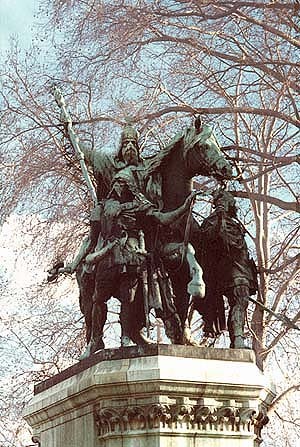 Let me consider here only one aspect: Charlemagne as a warrior. In the warfare of that time, where gunpowder and modern technical equipment were not present, the physical strength of a warrior was very important. So, Charlemagne - well armed and covered with iron - appeared then in a battle against his enemies like a tank would in our days. He was a kind of human tank, running over and devastating his enemies with his stupendous sword that never broke and never failed. When he advanced, he cut through and destroyed the enemies, leaving after him a wake through which his men could follow. From the descriptions that were read (above), you can imagine Charlemagne in battle. A tall man, advanced in years but still vigorous, white hair, eyes of steel, strong muscles, all covered with iron, mounted on a horse that is also raring to attack the enemy. He is the father of his people who takes upon himself great risks for the entire people, and advances to lead his people to victory. This was the man whom the inhabitants of Pavia saw pressing forward against them and cried out in fear: "O, the Iron Man! O, the Iron Man!" Yes, he was an Iron Man, but more important than that, he was a man who inspired an iron nerve in the warriors who fought for him and with him. When he was present, they all became iron warriors, and the army of the Iron Emperor was an iron army. He was more than a mere combatant, he was the source of the combativeness of the whole army. 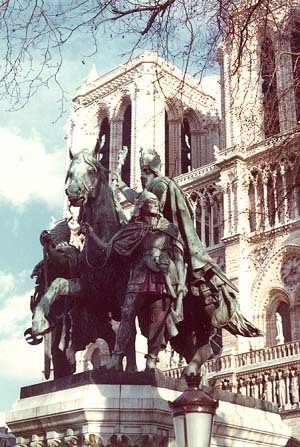 This was the man who fought against the unjust aggressors of the Frankish Kingdom and of the Holy Catholic Church, of which he was the defender. The battle over, the Emperor returns to the campground covered with glory, but also covered with dust, sweat, and blood. He goes to his tent and takes off his helmet; some assistants come to help him remove his armor. He washes and goes to eat. 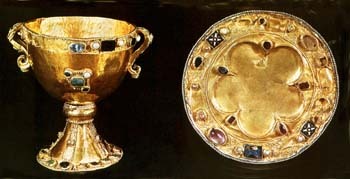 You can picture the Carolingian table: a wood trunk covered with a precious cloth, on it is a golden goblet in a strong primitive shape inlaid with roughly hewn stones to make it sparkle. Charlemagne asks for wine and drinks one or two full chalices, because a man so powerful of nature would naturally drink heartily. He eats, drinks, makes an unpretentious review of the battle, thanks Our Lady for the victory, and retires to sleep. In his huge bed he rests. His rest is communicative. When Charlemagne sleeps in his tent, that tranquility flows to everyone around him, and from there it spreads in concentric circles to reach all the warriors who are also resting. Even in his sleep he is the Guardian Angel of the army that slumbers. How calming it is for an army to know that it is commanded by an Emperor who is a giant called The Iron Man. He awakes, and his day begins at the campsite. He receives persons who want to talk to him. He is amiable, calm, accessible, transmitting his joy and goodness to everyone. He is the source of the contentment of the whole camp. He is at the same time the fortified tower that protects everyone and the fountain of fresh water from which all can drink. Everyone wants to sip a little of his presence. So, Charlemagne is the joy of the whole camp ground, the delight of the Kingdom of the Franks. Let us imagine that three or four Catholic Bishops, knowing that Charlemagne was in the area, come to present themselves, to speak with the Emperor, to request a few favors. Because they know the fame of Charlemagne as protector of the Church, they do not feel any sense of competition with him in his role as head of the temporal sphere. They feel esteem, respect, and affection. They know that they are Princes of the Church of God, and for this reason, Charlemagne is just one of the simple faithful before them. But they also know that God had chosen that one man as a Prophet to guide and protect the interests of the Church and Christendom and give to Him the victory. They approach with all assurance knowing that the Emperor will not dispute their prerogatives, but will treat them with due honor and respect. They also know that they have the liberty to ask anything they want - from a crusade to the building of a hospital - and that the Emperor will give them what he can. You can picture these men as they present themselves, grave, dignified, and serene. When they arrive, the sentinel makes a deep bow, all the talk ceases, and everyone looks at them. Someone announces: "The Bishops of the Holy Church of God have arrived. They desire to speak with the Emperor." 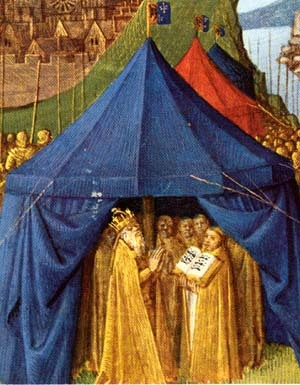 Another person goes to announce their arrival to Charlemagne. He raises up his immense frame and receives the Bishops standing. Greetings are exchanged. Charlemagne invites them to sit down: "My Lords and Fathers, what is it you desire?" We would like this and that. Charlemagne attends to the requests, and gives a little more than what was asked. Satisfied, they take their leave. The army raises camp and moves on to either another battle or returns to Aix-la-Chapelle for a period of rest and tranquility. 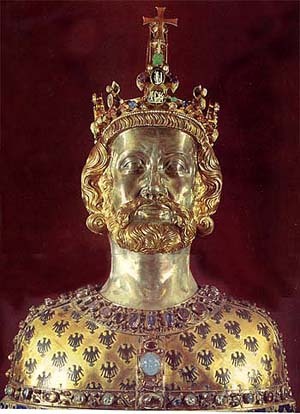 Here is the great Charlemagne: a kind of light that intensifies the color of everything around him. Before him the Bishops feel themselves more as Bishops, his sons feel themselves more as sons, the joyful souls are more joyful, the warriors more warriors. There is in him a propelling strength that it is not just physical power, but also the mental strength of a great soul, and more than that, an irradiation of graces that exudes from him. This makes him the source of the life and joy of the entire Empire. 1. Einhard, Life of Charlemagne, (New York: Harper and Brothers, 1880), pp. 56-7. 2. Historia Universal, Spanish Edition, vol. IV, pg. 790. 3. These comments were taken from personal notes of A.S. Guimarães, which were adapted and translated to English for TIA's website.